Traci and Marc had the perfect country wedding in Maine. The day started at the the old (1868) Sheepscot Community Church nestled among the houses and pretty seaside landscape of Sheepscot village. Traci's family lives just up the road and she and her bridesmaids were getting ready there as the tent and catering were busy setting up. 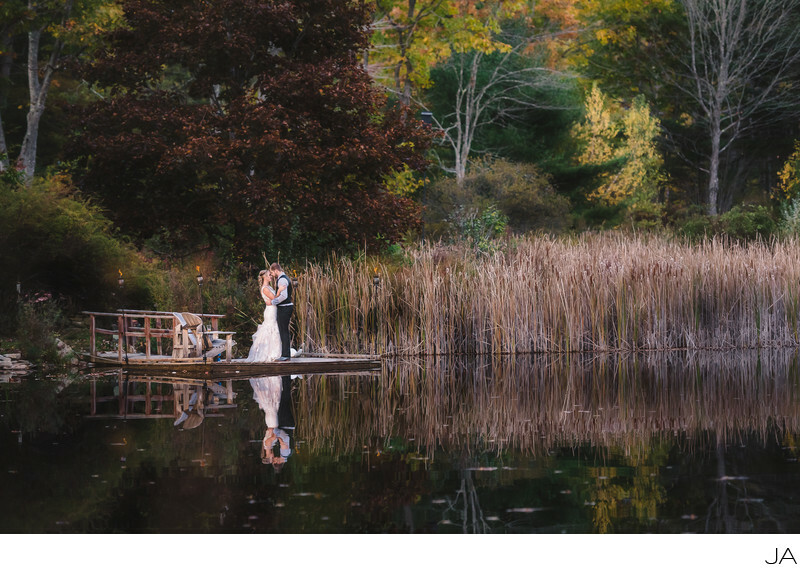 This image was taken at the private pond just steps from where their wedding reception was taking place. My assistant held a light as I took the image from across the pond. This is a very special place for them as many good times have been shared on the wonderful dock. Personally, I love colors in the foliage and the perfect reflection in the pond. Their wedding was so relaxed, cozy and pretty - just like a Maine wedding should be! Keywords: autumn wedding (6), Fall wedding (18), Joshua Atticks Wedding Photography (249), maine wedding. maine wedding photography (6).